Browse > Home / Hot Topics / KID-Systeme, Rockwell Collins, Airbus and a Lot More! KID-Systeme, Rockwell Collins, Airbus and a Lot More! Let’s face it, one of the most important amenities on an aircraft is the USB power. In fact, the longer the flight the more important USB power is. Why? Because personal device battery life is a function of time. As you may remember from an earlier issue of IFExpress, we touched on the Mirus Aircraft Seating integration project for AirAsia’s new Hawk slimline economy seating for their A320 fleet that includes the IFE peripheral experts, IFPL, who are supplying the USB interface port for USB consumer technologies. What you may not know is that KID-Systeme is the single source supplier for the USB power source via their SKYpower system. This initial A320 retrofit program, which was announced in 2016, is now up and flying and has been followed-up by a line fit order for the airline’s new Airbus A320/A321neo aircraft. During AIX we had the opportunity to talk with KID about the project and they indicated that the high-power USB outlet in conjunction with the In-Seat Power Supply unit minimize weight while limiting the intrusion into the passenger space, facilitating the passenger experience in Wi-Fi equipped cabins. “… we celebrate a striking success in Asia together with Mirus and we are pleased to announce our new relationship with Mirus and IFPL, offering an innovative, low cost, low weight & high-power USB solution. The system can be installed on Airbus line-fit aircraft as well as on all types of retrofit programs”, says Jens Markworth, VP Sales KID-Systeme GmbH. 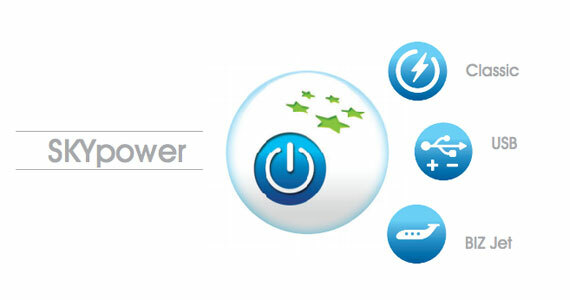 SKYpower is designed with high power efficiency and low standby power and is intended to guarantee passengers with sufficient power to use their electronic devices, whether they be laptops, smartphones, and/or tablets en route. We foresee more teaming efforts like this one in the industry’s future. Five Rockwell Collins engineers have been named to the fifth annual class of Rockwell Collins Fellows at a special ceremony yesterday with company leadership and members of the first four classes of Fellows. Implemented in 2014, the Rockwell Collins Fellows program distinguishes exemplary engineers whose leadership, innovations and technical expertise — along with their dedication to mentoring others — advances Rockwell Collins and their respective fields. Gogo Business Aviation says its AVANCE L5 connectivity system was installed on the 200th aircraft; it expects 500 by the end of 2018. Airbus has inaugurated the fourth Hamburg A320 Family production line. Making use of digital technologies and a more flexible industrial set-up, the innovative state-of-the-art line is a key enabler for ramping up the single aisle program to 60 aircraft per month by mid-2019. With more than 14,000 A320ceo and A320neo Family aircraft ordered and over 8,100 delivered, the A320 is the world’s most successful single-aisle aircraft family. Incorporating the latest state-of-the-art technologies including new generation engines and Sharklets, the A320neo Family provides 15 percent fuel savings at delivery and 20 percent by 2020. To date the A320neo Family has captured nearly a 60 percent market share with more than 6,000 orders from 100 customers. The A320 Family aircraft are manufactured globally, at Airbus sites in Europe, China and the US. In addition to the new production line, Airbus also inaugurated a larger and modernized Hamburg A320 Family delivery center with more customer areas, more efficient delivery processes and increased hospitality services. Airbus and the government of Côte d’Ivoire signed a Memorandum of Understanding (MoU) to establish a framework of collaboration to support the development of the country’s aerospace industry which has been identified as strategic for its economic development. Under the terms of the MoU, Airbus and the government of Côte d’Ivoire will explore channels of cooperation in developing the aerospace sector in Côte d’Ivoire in various areas. “We are confident that this partnership with Airbus will contribute to Côte d’Ivoire’s economic growth as well as support us build a stronger framework for industrial development, creation of jobs and capacity building for our country,” said his Excellency Daniel Kablan Duncan, Vice President of the Republic of Côte d’Ivoire. We are committed to deliver on our vision and make Côte d’Ivoire a hub for aerospace technology in Africa,” he added. “Collaboration between the public and private sector is essential to facilitate economic and industrial growth. Through this MoU we will work closely with Côte d’Ivoire’s government, share expertise, discuss opportunities and support efforts in building a robust and sustainable aerospace sector. At Airbus, we are committed to supporting the sustainable socioeconomic development of Africa through partnerships such as this. ” said Guillaume Faury, President Airbus Commercial Aircraft. The A330neo, Airbus’ newest widebody aircraft, has embarked on a worldwide tour to demonstrate its readiness for airline operations. As final step in the aircraft certification phase these function & reliability tests, also known as route proving will include ETOPS missions, landing at diversion airports and testing airport handling services. After a fly past over Airbus’ European sites, the A330neo will head for 15 major airports worldwide over five continents, aiming at achieving 150 Flight Test Hours in three trips. The route proving tests are performed with the first A330-900 production aircraft, fully equipped with an Airspace by Airbus cabin and flying in launch operator’s Tap Air Portugal colors. The aircraft first flew on 15th May 2018 launching flight-tests to check cabin systems such as air conditioning. The route proving tests form part of the last trials required for aircraft Type Certification scheduled for summer 2018. Launched in July 2014, the A330neo family is the new generation A330, comprising two versions: the A330-800 and A330-900 sharing 99% commonality. It builds on the proven economics, versatility and reliability of the A330 family, while reducing fuel consumption by about 25 percent per seat versus previous generation competitors and increasing range by up to 1,500nm compared to the majority of A330s in operation. The A330neo is powered by Rolls-Royce’s latest-generation Trent 7000 engines and features a new wing with increased span and new A350 XWB inspired Sharklets. The cabin provides the comfort of the new “Airspace” amenities. Cathay Pacific Airways has become the second airline to operate the A350-1000, the world’s newest long range widebody airliner. The airline took delivery of the aircraft at a special event in Toulouse, France. The aircraft is the first of 20 A350-1000s ordered by Cathay Pacific and will join the carrier’s growing fleet of A350 XWB aircraft, which already includes 22 A350-900s. Both aircraft are complementary and provide for maximum commonality with unmatched operating efficiencies, while offering passengers the highest levels of comfort in all classes. Travelers will benefit from absolute well-being in the cabin, with more personal space, optimized cabin altitude, more fresh air, controlled temperature & humidity, integrated connectivity and the latest generation of in-flight entertainment system. With its true long-range capability, the A350-1000 will form an important part of Cathay Pacific long-haul operations. The aircraft will be deployed on the airline’s new non-stop route from Hong-Kong to Washington DC, representing the longest flight – approximately 17 hours – performed by any airline out of Hong Kong. Global air transport IT provider SITA has announced that its technology, BagJourney, is managing baggage for an increasing number of the world’s airlines. In the first six months of this year alone, more than 20 airlines have chosen the solution. SITA BagJourney is one of the key technologies helping the industry meet the IATA Resolution 753 requirement to track every stage of every bag’s journey.To meet the conditions of Resolution 753, airlines must track every item of baggage at four key points in the journey: at check-in, loading onto the aircraft, transfer and arrival. The biggest challenge airlines and airports face doing this is scanning at the point of transfer and on arrival. Typically, these were not areas of the airport where scanning was done so they require attention and new infrastructure. With a growing number of customers, SITA’s baggage management technology is firmly established as the solution of choice for the air transport industry. Together, SITA’s BagJourney customers handle hundreds of millions of bags each year and these airlines are enjoying as much as 30% reduction in the rates of mishandling. SITA has been the recognized leader in bag tracking and tracing for more than 25 years with its systems in every major airport in the world. SITA BagJourney is the world’s first community-based baggage tracking system that provides an end-to-end view of the baggage journey using data from multiple sources. Today, SITA is leading the baggage community by providing technology and professional services to help airlines track baggage and unlock the value of the vast amounts of tracking data that will be produced. The London School of Economics, in association with Inmarsat Aviation, has revealed the findings of Sky High Economics: Evaluating the Economic Benefits of Connected Airline Operations. The report finds that consolidating the advantages of connected aircraft could deliver substantial economic benefits for the global airline industry, as well as significant environmental benefits, including a reduction in the industry’s annual global fuel use and a net reduction in CO2 output. The potential for multiple savings, efficiencies and safety opportunities could equate to a 0.75% – 1.00% reduction in the IATA consolidated US$764 billion annual global airline costs of operation. This is the second chapter in the Sky High Economics series, a first of its kind research report evaluating the economic value of connected aircraft from now until 2035. The first chapter, on the economic value generated by passenger connectivity, was released in September 2017. On 15th June, the all-new DreamWorks Theater of Universal Studio Hollywood was opened in L.A.. Hainan Airlines has organized an inflight activity themed ‘DreamWorks Theater’ with Universal Studio on their HU469 from Chengdu to Los Angeles and they have also launched four KungFu Panda liveried aircraft. The DreamWorks Theater flight served by the third KungFu Panda liveried aircraft, in which all the flight attendants wore the new uniform to introduce the opening of DreamWorks Theater, as well as, sharing with dedicated Po fans Universal Studio brochures, and a Universal Studio ticket worth $129 to every passenger! In addition, the entertainment project was revealed on this flight which was the new film Kung Fu Panda: The Emperor’s Quest, which recounts Po’s perilous mission to deliver the rare and precious Liquid of Limitless Power to the Palace. With Po’s new dream on the Kung Fu Panda liveried aircraft, Hainan Airlines graciously invites passengers to participate in the opening of the DreamWorks Theater. We note that this year remarks the 10th anniversary of Hainan Airlines entering North American market. Hainan Airlines has enjoyed rapid development on North American route network over the past decade. Since the launching of Chengdu-Los Angeles route on March 15, 2017, Hainan Airlines has now opened twelve routes from domestic key first- and second-tier cities to Los Angeles, Las Vegas, Seattle, San Jose, Chicago, Boston and New York. Watch this one: Lufthansa has had preliminary take-over talks with Norwegian! If you want to check out the world according to Gogo, why not get their free “In-flight Connectivity 101 ebook. It’s free to download here In-flight Connectivity 101 eBook – Avionics and it is full of data – really good info!